Celia Thaxter’s unique island garden is not easy to visit on Appledore. This film brings the story to those who can’t make the trip. Often I hear people say, “How do you make your plants flourish like this?” as they admire the little flower patch I cultivate in summer, or the window gardens that bloom for me in the winter; “I can never make my plants blossom like this! What is your secret?” And I answer with one word, “Love.” For that includes all,–the patience that endures continual trial, the constancy that makes perseverance possible, the power of foregoing ease of mind and body to minister to the necessities of the thing beloved, and the subtle bond of sympathy which is as important, if not more so, than all the rest. The Shoals Marine Laboratory conducts tours of the garden seven times each summer, bringing out 24 people on each day trip from the dock at New Castle, New Hampshire. Some tours are canceled due to weather conditions. Although the garden is well known, it’s not easy to visit and many people are unable to make the trip. Although the garden has been described in newspaper and magazine articles, it has not been the subject of a film. While we can’t bring the salt air to you we can provide the sounds of the waves crashing on the rocky shore of Appledore, the squawking of the gulls and best of all the colorful flowers blowing gently in the ocean breeze. We can tell you the story of Celia Thaxter and her life on the island with her creative friends. And you can see John Kingsbury describe how he recreated the garden. Listen to well known New England landscape garden experts describe how this little plot compares with other famous gardens. 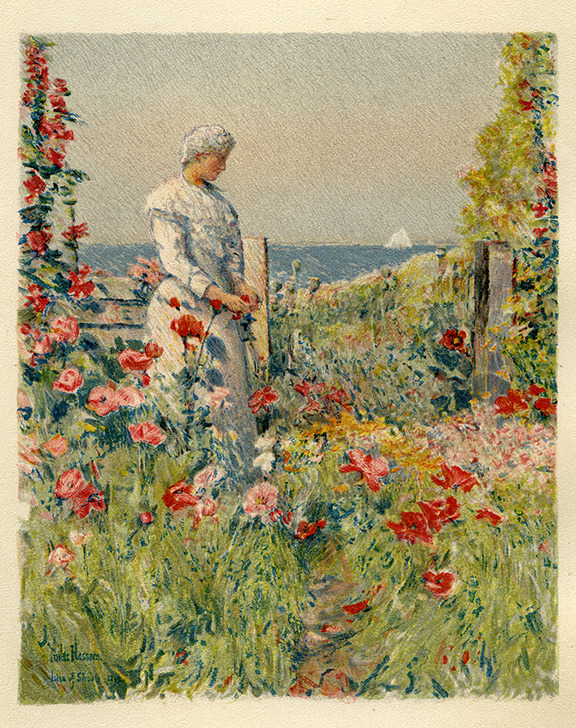 The finished film will bring the garden and its story to all those people who are interested in Thaxter, Hassam, the Isles of Shoals, New England’s history and literary tradition, and of course gardening. I’ve been photographing on the Isles of Shoals since 1974. I’ve issued two books of my Isles of Shoals photographs, and as a publisher, now retired, I have produced 20-25 different books about these islands, including several books by and about Celia Thaxter. I’ve been making still photographs of Celia’s Garden for more than 30 years. These nine islands are my favorite place to be and I go out each summer to conduct a photography workshop on Star Island. As much as I enjoy still photography, I’m now getting excited about video. Last year I photographed and produced my first film, Farming 101. This new film about Celia Thaxter and her garden is to me a logical progression in my 40-year fascination with photographing the Isles of Shoals.